Yes, I know, I skipped a day! I'm SO SORRY! I was on vacation and I got back yesterday and I was just SO TIRED. I had been up for three nights straight with my friends, and I just did not have the energy to post. Anyway, Welcome to Day Nine my SECOND BLOGAVERSARY! 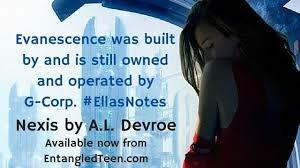 I have with me today A.L.Davroe, author of the SciFi YA novel, Nexis. You can read my GUSHING review of her book here, check out the interview and enter the giveaway below! We have with us today the AMAZING A.L.Davroe on A Thousand Words A Million Books today, and she has awesomely answered a few burning questions I’ve had since I read an ARC of Nexis in December! I'm so excited that you’re here! 1. 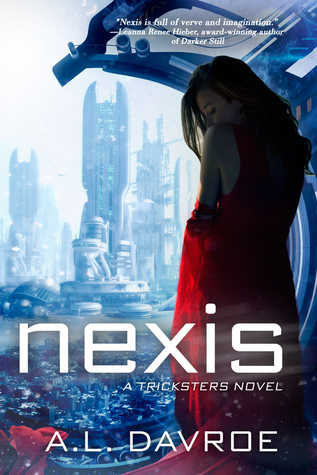 Tell us in one sentence what Nexis is about and in another, why we should read it? I hope that readers pick up Nexis for a number of reasons. It’s just plain fun. Yes, there are some things that have already been done – there is nothing truly unique in this world – but, the combination is something new and exciting. The futuristic setting and how it came about, the technology, the characters, the love story, the game, and the format of the book are all just a little different but still relatable in a way that (I hope) doesn’t leave readers feeling alienated and confused by things they haven’t yet encountered. The main characters are dynamic, strong, continue to grow throughout the series, and are a wonderful couple who work well together. In addition to the fun, it has those sci-fi fantasy aspects – lots of world building and a complex socio-economic undertone that makes you think. So, not only is it candy, but it’s good for you too! *shining endorsement* LOL! It’s a good novel for teens and adults, men and women alike. 2. If there was one piece of advice you could give your main characters, what would it be? 3. What gave you the idea of creating a virtual reality inside the book? How fun was it to make up in your head? I’m not entirely sure why I decided on the virtual reality game. I suppose it must have been a combination of various movies, shows, books, and video games that I’ve watched or played over time. Tron, Avatar, Matrix, Ender’s Game, Sword Art Online, .hack//Sign…I’m sure they’ve all influenced me to some degree. I needed a place for Ella to escape to and it was a futuristic world with advanced technologies. Gaming has always been a fine way for people to escape their world and her setting seemed perfect for it. It also allowed me to do a great bit of world building, which I love. It was incredibly fun to create the various glimpses of different worlds for NEXIS as well as come up with the structure for the game itself. 4. Tell us about the day you found out you were getting published? It was very subdued actually. At the time, I was going through a very painful divorce and trying to rebuild my life. That, combined with the length of time it took to get published (the failed books, all the rejections from agents and then editors, the thousands of versions) made the phone call very surreal and it never really sank in. I suppose I was just expecting “the other shoe to drop;” like maybe someone would pop out of the closet and declare I was on candid camera or something. book did that for them is the most beautiful, humbling thing I can think of. 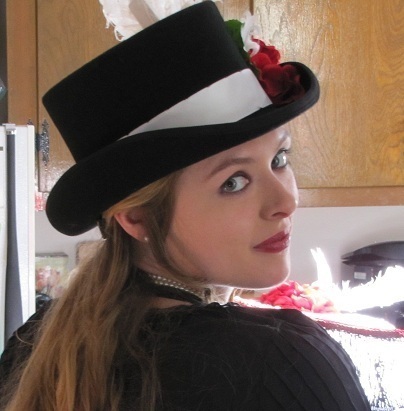 paranormal, romance, Steampunk, and fantasy. She is the author of Salvation Station (adult psych horror), The City Steam Collection (adult psych horror), For Your Heart (YA Paranormal Romance) and her YA Sci-Fi novel, Nexis, is coming out with Entangled Publishing December 1, 2015!